Vision therapy stems from the practice of orthoptics, pioneered in the latter half of the nineteenth century by the French ophthalmologist Javal. Over the years, the current practice of vision therapy has developed into a wider range of treatments to incorporate amblyopia, strabismus, and visual perceptual development that allow for the transfer into daily requirements. Optometric Vision Therapy is guided to develop visual abilities and to achieve optimal visual performance and comfort. During vision therapy, patients gain greater understanding of their visual abilities and learn how to develop the ability to efficiently apply these learned skills to relevant tasks and activities. Understanding the principles of vision therapy requires an understanding of the concept of visual function that involves the ocular and visual-motor mechanisms. For this reason, Optometric Vision Therapy is performed under a developmental optometrist’s supervision. The goal of Optometric Vision Therapy is to develop visual abilities so that the patient can meet the visual demands required during specific tasks with greater efficiency and endurance. 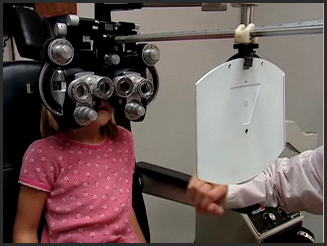 Optometric Vision Therapy involves the use of structured and appropriately sequenced sensorimotor techniques in a visually controlled condition. Lenses, prisms, filters, and occlusion are frequently used during therapy.